"An Appeal To The Laboring Man"
This collection contains 60 recordings from 1937 through the late 1970's of Father Coughlin's popular radio broadcasts, sermons, and interviews. 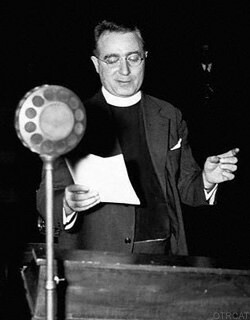 Father Charles Coughlin is an interesting and influential figure in American radio broadcast and political history. In 1926, Father Coughlin took to the airwaves and eventually became one of the most successful radio personalities and greatest public speakers in American history. During his zenith, he was heard by a third of all radio listeners in the country. Father Coughlin was known as "The Radio Priest" and in his early years of broadcast, he spoke of theology and the Catholic Church. By the 1930's he shifted gears to discuss politics and economics; he was especially concerned with economic reform. A strong supporter of Franklin D Roosevelt, he turned against the president when he enacted the New Deal. He was often concerned with whom he called "money changers", but would specifically refer to Jewish leaders and prominent figures. Amid evidence of anti-Semitism, the Catholic Church forced Father Coughlin to quit the radio in the 1940s and return to work as a parish priest. He wrote frequently about conspiracy theories about Jewish leaders and the communist party, to his death he was convinced that a Jewish organization caused the Russian Revolution. 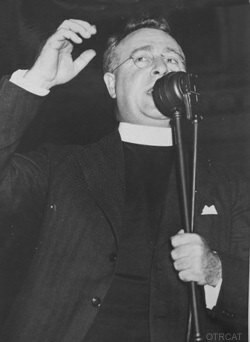 Despite his objectionable and peculiar political leaning, Father Coughlin is a very important historical figure and was listened to many throughout his broadcast duration. This collection includes broadcasts from as early as 1937 and covers a multitude of political and historical events. Be the first to comment on "Father Coughlin"